Master Sergeant Buster "Buzz" Bay was head of Bay Aeronautics Industries Inc. - a company known as a major innovator in the world of flight. In 1957 he launched what would soon become a phenomenon in aerial security – the Bay Surveillance Blimp. From these mighty air ships, trained officers would scout vigilantly for wrong-doers and crisis situations. And when they discovered any of these … they would leap into action. The Bungy Bounce training center in the Adventure Dome was designed by Buzz as the perfect way to ready his squad of Parachuted Protectors in the disciplines of sky patrol, air search and rescue, and cloud diving. No vile villain or dire situation was beyond the reach of what the papers dubbed the "Plummeting Policemen". Among their many achievements were the foiling of the Blue Sky Gang, the capture of Oyster Bay Pearl Thief, and the rescue of countless kittens caught in trees. But progress changes everything. By the mid 1970's new forms of sky patrol were developed and Buzz retired in 1979. He set sail in his favorite air ship, "The Eagle's Talon" , searching for new challenges. But not before donating the schematics of the Adventure Dome to the family archives. 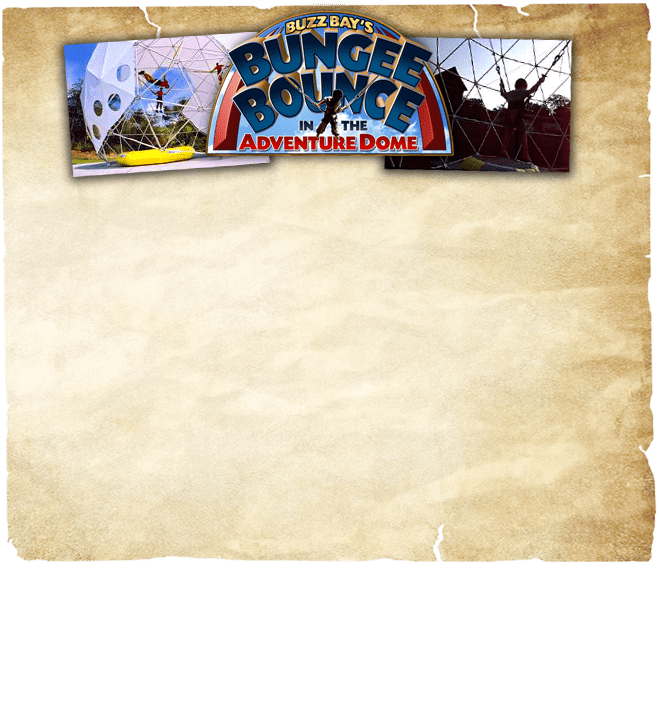 And now, working alongside the original plans, top Bayville scientists have created a state-of-the-art Bungy Bounce in the Adventure Dome so that you can take the plunge and test your skill. The sky's the limit, so jump right in. Drop everything, dive in and become, as Buzz would say, a Flying Force For Freedom!